World renowned journalist, and award-winning filmmaker Rahiem Shabazz presents the third installment of his docu-series Elementary Genocide: Academic Holocaust. The first two documentaries in the series; The School To Prison Pipeline and Elementary Genocide 2: The Board Of Education vs. The Board of Incarceration received critical acclaim and launched Shabazz as a political pundit and academic ambassador for the African American community. Elementary Genocide: Academic Holocaust adds more statistical proof of the scholastic inequalities faced by Original people around the country. The documentary revisits the importance of education and its impact on self-image, family structure, financial freedom and the collective future of African/indigenous people in America and abroad. With commentary from some of the 21st century’s greatest minds of the African diaspora in America, such as financial scholar and social commentator Dr. Boyce Watkins, esteemed Pan-Afrikan scholar and Professor James Small, and Kaba Kamene, international homeschooling advocate Samori Camara, Hip Hop artist and education advocate David Banner, National Talk Show Host and Lecturer Michael Imhotep and best-selling author Shahrazad Ali, Shabazz was able to illustrate the hypocrisy behind America’s public school system and how the infrastructure is designed to keep people of color from developing the capacity to recreate themselves, their families and their institutions with their own hands. Rahiem Shabazz continues the conscience-raising dialogue generated by his acclaimed documentary Elementary Genocide: The School To Prison Pipeline with his equally hard-hitting Elementary Genocide 2: The Board of Education vs The Board of Incarceration. Featuring interviews with noted educator and Black psychologist Dr. Umar Johnson, Chief Juvenile Court Judge Steven C. Teske, fearless former U.S. Congresswoman Cynthia McKinney, former political prisoner and Black Liberation Army co-founder Dhoruba bin Wahad, popular social commentator Dr. Boyce Watkins, award-winning education reformer Dr. Steve Perry and more, The Board of Education vs The Board of Incarceration uncovers the true purpose of today’s educational system and how it’s failing the African child. Going beyond the school-to-prison pipeline headlines and conspiracy theories, The Board of Education Vs. The Board of Incarceration proves that something sinister is afloat by digging deep to explore its origin, its existence and how to plot its destruction to save every Black child. 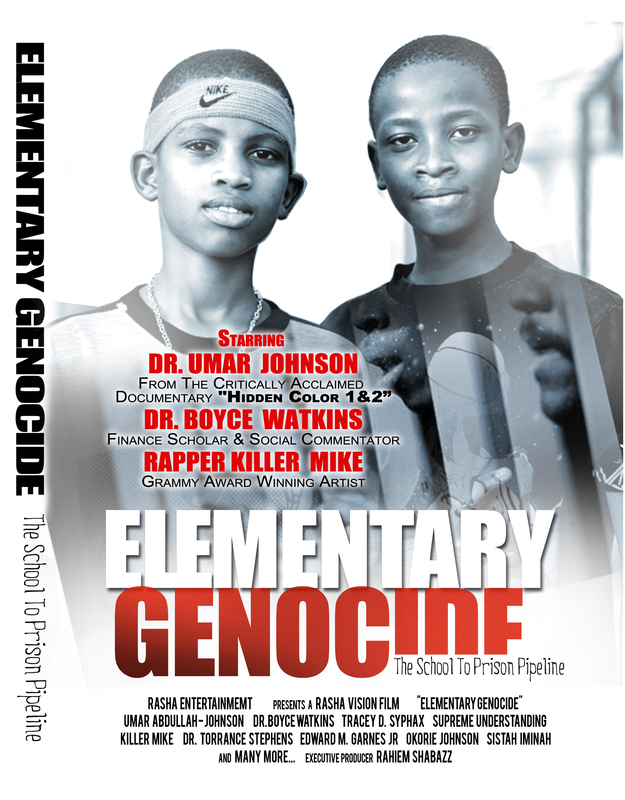 Elementary Genocide is a documentary executive produced by award winning journalist/filmmaker Rahiem Shabazz. The documentary appeals to a wide general viewership by addressing the social, cultural, political and personal ramifications of how the federal government allots money to each state, to build prions based on the failure rate of 4th and 5th graders. In America, where half of the 4th grade is reading below grade level and more African-American males are in jail than are in college, Elementary Genocide serves as a striking reminder of a flawed system in need of repair. Elementary Genocide consists of candid interviews and voice-over narration culled from original interviews from professors, teachers, best selling authors, children, parents, celebrities, etc. A few notable appearances are made by Dr. Umar Johnson, Dr. Boyce Watkins, Supreme Understanding, Dr. Torrence Stephens, Tracey Syphax, Killer Mike, Kadidra Stewart, Edward M. Garnes Jr., Okorie Johnson and Sistah Iminah.